The following report is from Michael Witcher, who describes his trip to Farina for the ANZAC memorial service. His trip reflects the experiences of many who make their annual "pilgrimage" to Farina for either this service (held every 3 years) or the annual restoration season of 8 weeks in total. Each volunteer staying for either 1 or 2 weeks. Irene and I had a lunch to attend on Monday. We had the vehicle fully packed, so at about 3.30pm, headed north. Cappuccino at Pt Wakefield then onwards to the Tin Man near Port Pirie for a light evening meal and stay in a cabin for the night. We took single serve containers of fruit, small bottles of fruit juice and mini bite breakfast biscuits, so a self catered brekky before heading to Pt Augusta. A visit to a supermarket to buy flowers for a couple of graves, Vegemite scrolls and muffins, before visiting one of our neighbours from when we lived there and took her to the cemetery to visit her husband and husband of another neighbour. Took her home and began the long haul north. In Hawker on Elder Terrace opposite the information and toilet block is a Cafe which was Sight Seers, but is now owned and operated buy a chef and his partner. We didn’t want a large lunch, so opted for a steak sandwich. It consisted of an oval bun, the narrow dimension was the same as a hamburger bun, in effect one and a half beef burger, and not surprisingly a cappuccino. At the Flinders Food Co (as the cafe is now known) we met a couple of brothers I knew from working on the railway guard house (Mario and Joe Viana) and told them of the steak sandwiches. Refuelling was done at Hawker Motors, with a chance to catch up with John and Janet, the owners. We dropped in to Leigh Creek as a recco to find the L/C Outback Resort and make ourselves known before continuing to Lyndhurst. The hotel was buzzing with guests and the dining room and bar area was full of diners, a lot of folks doing Anzac Day in Farina, Mario and Joe Viana and some friends of theirs also stayed there. Luckily we had a cabin on the opposite side of the car park. Constantly waking and checking the watch, as the alarm phone was set for 4.40am. At 4.15 we rose and got on the road by 4.30, Vegemite scrolls on the run before we left the bitumen. We found a car park opposite the camp ablution block, but were told it was for VIP official guests. Mention was made of going to the top of ANZAC Hill, which we did. Many chairs were set up in front of the flag pole and memorial wall and a PA system in operation. I’m not good at guessing numbers, but I put the audience as several hundred. We took our own chairs and set the video camera up on a 7' high tripod to record the event. The service speakers were some of the Farina group (Tom and one or two others) The Bishop of Willochra Rt Rev John Stead and the Director of Veterans S.A. Rob Manton. On completion we adjourned to the car park where the big catering van and a couple of BBq’s were set up to provide breakfast, Bacon and egg roll, ANZAC biscuit pack and Coffee and Rum, neat coffee or tea. There were speakers talking of WW1 stories of relations or friends, and we were offered to write on a board those of our ancestors who were involved in war operations from all conflicts, we put our fathers and Irene’s Grandfather who was a Gallipoli man. We had part of Gpa’s memory book about his war experience, which we gave to the Rob Manton, who was very interested and asked permission to use it on their website, I have since sent him some photos and a couple more excerpts from his memoir. Just before the cemetery entrance is a small fenced off section of graves. There is no history of that. We all went there and the Bishop performed a consecration service on the area and a sign was unveiled. The Bishop was to have a service at Leigh Creek, but it was decided to hold it in the front half of the Patterson House. 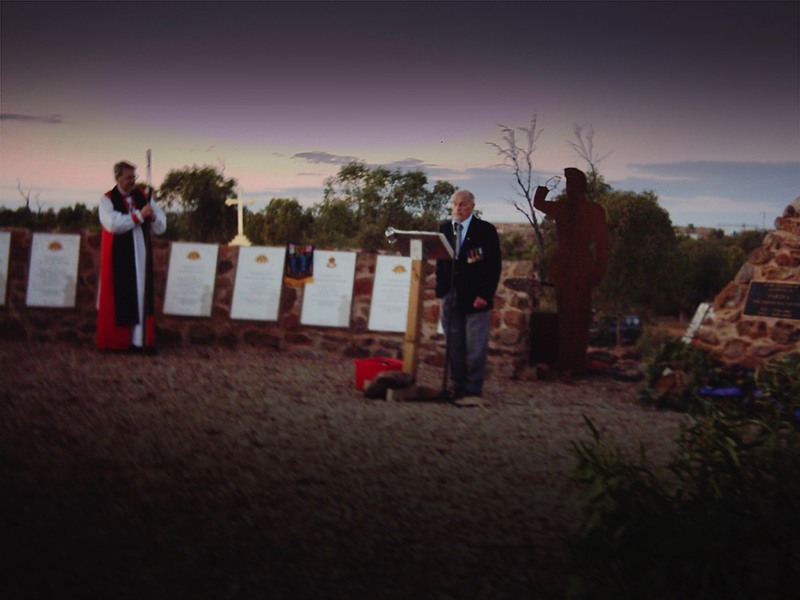 The first ever use of the house was a Eucharistic Worship for the people of Leigh Creek and those of us from the folk up for ANZAC Day. Lunch was two serves of BBq sausage and onion on bread and coffee or can of drink or water. There were dozens of Farina volunteers in their hi vis vests doing all the arranging and organising, cooking et al. Although I took my vest, it remained hidden, I had explained to Tom (the convenor of the group) that I was attending as a guest, not a worker, though I did modify a microphone mounted on a wooden ladle (my last story) to look a bit more professional (a length of black plastic pipe). I had a chance to do some measurements for cable lengths to do a couple of radio installations. We disappeared before the AGM, heat and lack of sleep helped this decision. 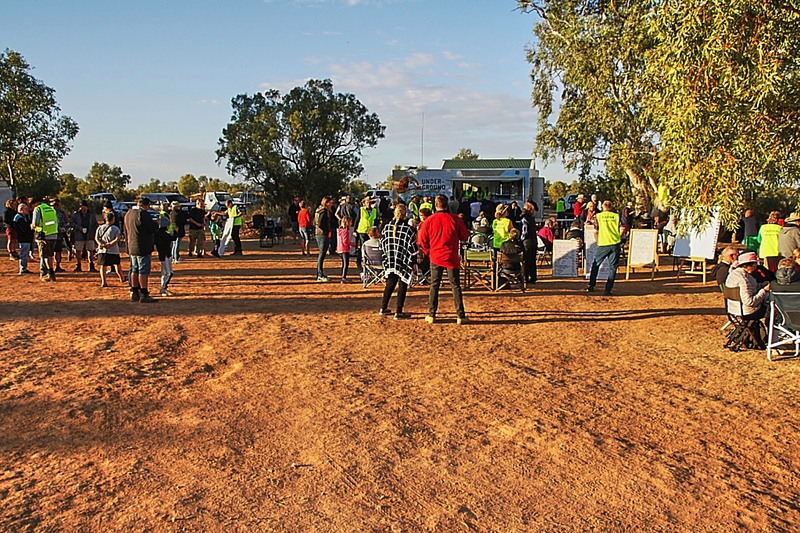 The night stop was at The Leigh Creek Outback Resort. We had had our fair share of yeast product so opted for a breadless beef burger for dinner, a rectangular plate with a large beef burger, molten cheese and bacon on top, serve of tasty relish, and a small mountain of lettuce, coleslaw, tomato, onion etc. No alarm clock in the morning, but we woke in time for our self catered brekky and 9am check out. On the road again (sounds like a song title) and back to Hawker, Flinders Food Co for, you guessed it, cappuccino, a visit to Jeff Morgan Gallery and Panorama. The main object this time was to see the new panorama. There is a huge display of rocks from all over, a collection of the late Quentin Smith from Quorn who had a museum, service station and TWIT (Travel with Intrepid Tours), back to Teague’s to refuel. In Port Augusta we met our neighbour again to get details of where the aged care home was, where our other neighbour now resides, then visited her. Light dinner and cappuccino at the Tin Man, cappuccino at Port Wakefield and home about 9.30pm. Thursday morning was cleaning out the vehicle, washing for Irene then some grocery shopping. We saw some news footage in the hotel on Wednesday night, and heard of a town, population 6 with a crowd of 60. At Farina, a town of 2 (both attended) we had a crowd of hundreds. The small grave section that Mike mentions (above) was an area outside the consecrated cemetery grounds in which many very young children, too young to have been baptised, were buried. They have remained in this unconsecrated area until this year when Bishop Stead conducted this long overdue consecration service. Just before the cemetery entrance is a small fenced off section of graves (see note below). There is no history of that. 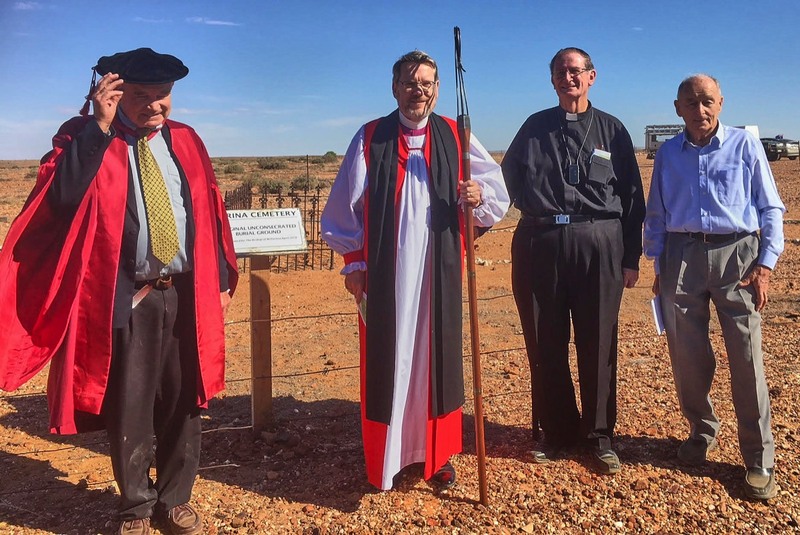 We all went there and the Bishop performed a consecration service on the area and a sign was unveiled. 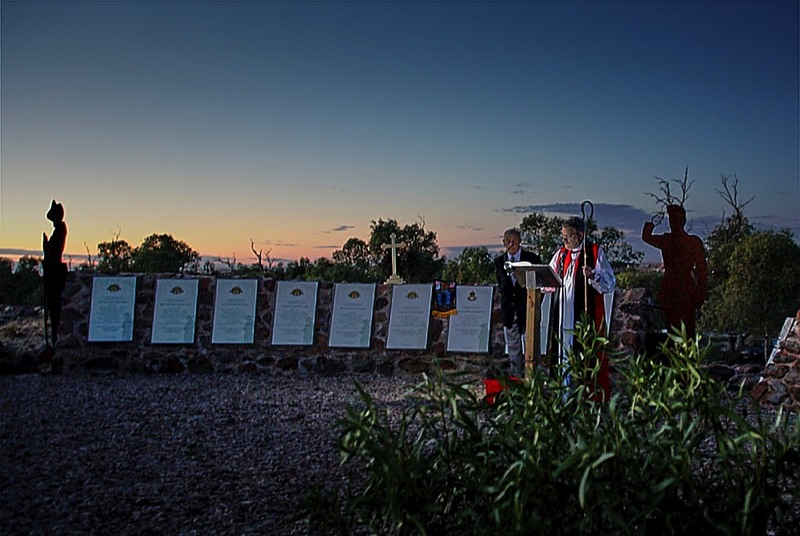 ANZAC Day 2018, saw dawn breaking over the Flinders Ranges to the South, with 290 persons present at the Farina War Memorial. They were assembled from across four Australian States to respect and pay homage to our Defence Force Veterans of all services. 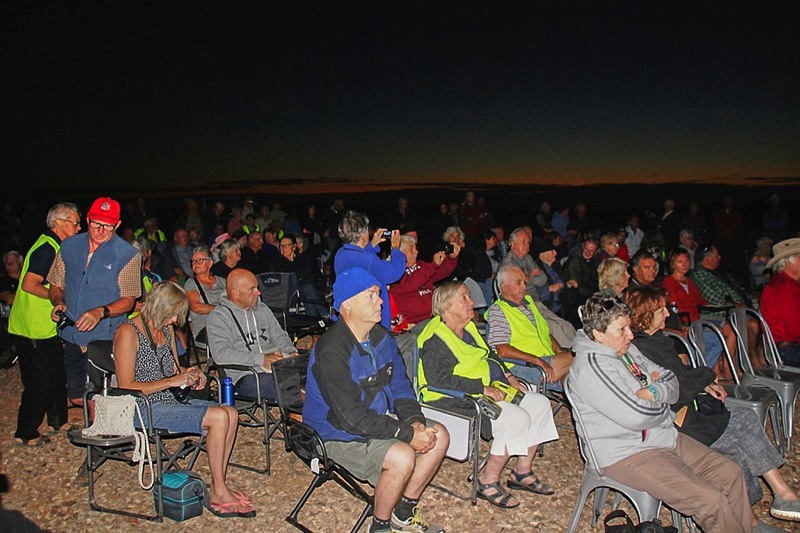 The rocky outback location inspired reverence and respect as friends and relatives joined in the tribute. The service was led by Tom with early Military Band music and a vocal quartet. Key components of the service were presented by our Chaplain, the RT. Rev John Stead, the Director of Veterans, S.A. Robert Manton and Mrs Anne Dawes. Robert Manton for the State of S.A. Participants carried the spirit of reverence from the service into the Spirit of Anzac program which followed the Gunfire Breakfast. At this session those attending named 145 former Service personnel who were close to their hearts on this day. Their names were displayed and they were honored. Robert Manton gave an enlightening address which drew us closer to the ordeals these service persons encountered. 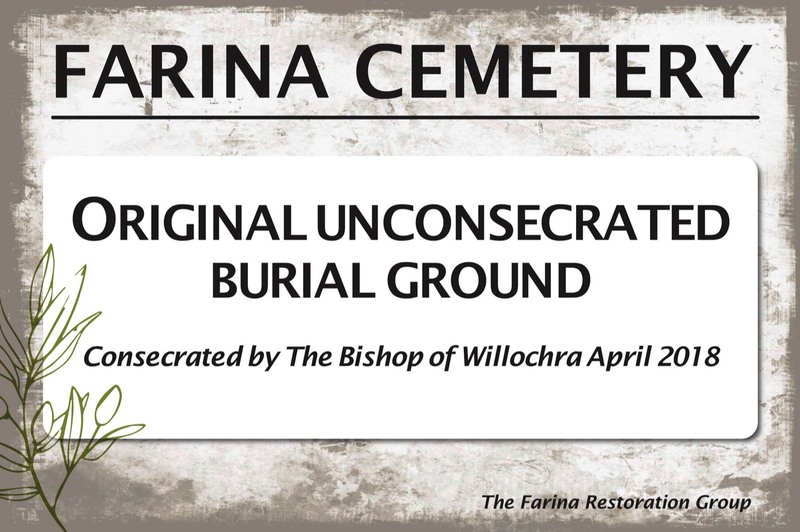 Farina Restoration Group has been aware of an unidentified separate section of the cemetery. Its purpose was discovered in 2017. In earlier times, unbaptized children were not buried in a “sanctified” Cemetery, thus there are 25 plots in a separate area. This situation was put right at 9.30am on ANZAC Day by the Bishop of Willochra, the RT Rev John Stead, when he sanctified the ground in which they are buried. This section of the cemetery is now “signed” accordingly. In earlier years of Farina, the Roman Catholic and Church of England Churches were an active part of Farina life. It is appropriate the first community function to be held in "Patterson’s House" was a community ecumenical service of worship at 11 am, on ANZAC Day. In previous years this would have been conducted at Leigh Creek. Bishop of Willochra, Rev. Trevor Briggs, Tom Harding and Dr.Bob Brownlee during the cemetery consecration.